The cane toad was introduced into Australia in the 1930s for control of sugar cane pests. They failed as a biological control agent. Instead, they became a major environmental pest in the north east of Australia. Cane toads prefer open grassland to light forest areas. They survive very well in the urban and rural areas of Jacobs Well. Correct identification of Cane Toads is important, since some native frogs can look toad-like. 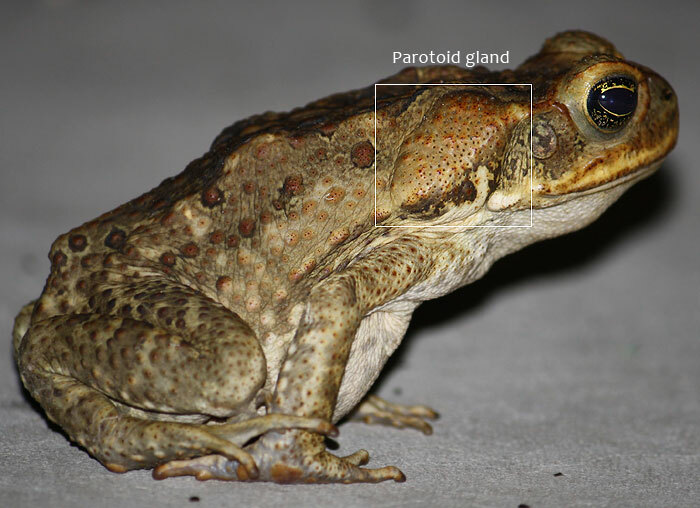 Cane toads are readily identified by their dry warty skin, bony ridge extending back from the nose and the paired parotid glands, which are distended beyond skin surface. The skins, but especially the parotid glands, contain a thick white liquid termed bufotoxin. This is a mixture of over one hundred chemicals, with some very toxic ingredients. When threatened the Cane Toad can spray toxin at their attacker. Pets are mainly affected while attacking/playing with Cane Toads. Most poisonings occur early evening when Cane Toads are most active. Affected animals are usually found with the toad. If the toad is unseen, then diagnosis can be based on the intense drooling by the pet. Treatment consists of initially removing the milky toxin from the mouth. Wash the face and especially the mouth with copious quantities of water. We recommend 5 minutes with a slow running hose. If all is well, no further treatment is required. Bufotoxin is very bitter and causes the gums to go very red. Severely affected animals may present with a range of signs depending on the particular mix of bufotoxin exposed to. Signs include: staggering, fever, convulsions and severe tachycardia (high heart rate). Death may occur if not treated promptly.